This first volume of Assault Gun III: Backbone of the German Infantry puts the weapon in its historical context and provides information about the production and use of the Sturmgeschütz III in combat. Volume II will provide information for identification of variants and their production months. 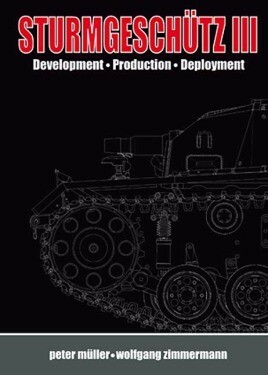 Both volumes together will give the readers a full survey of the technical development of assault guns and assault howitzers. For this publication there were about 400 historical documents and document series processed, selected from the many which were available. These chosen documents form the basis for a new historical perspective on this important Wehrmacht weapon system. The documentation is illustrated by some 125 photographs, some of them hitherto unpublished, 70 graphs and plans about the Assault Gun and some 500 source references. To make navigation easy, documents and illustrations are arranged in chapters that follow the historic timeline: technical development of the Sturmgeschütz, series production, the variants of the assault guns and their deployment with Heer, Luftwaffe and Waffen-SS. Rounding off the publication is a section giving details of production, acceptance and delivery of the Sturmgeschütz. For the first time it is possible to research the production numbers accurately and to express them in a way the reader can understand. A list of references, covering four pages, closes the appendix of the documentation. The list of the used sources is, because of its size, not printed in the book but is available for download on the publisher's homepage. The author, Peter Müller, is a Swiss citizen born in 1960, whose command experience as a Lieutenant Colonel and Director in large companies neatly complements his qualifications as a military historian. For the past quarter of a century, he has made detailed investigations of armaments issues in the 1914 - 1945 period. Combined with extensive studies of archived records, that background has allowed Peter Müller to present the subject matter of this book from a more differentiated perspective than hitherto.The author challenges, links and complements key statements and opinions, thereby arriving at entirely new conclusions. …offers a wealth of data for the modeler as well as those more interested in the technical aspects of this weapons system. A tremendous resource for armor modelers!